Some people appear to always be ready to run or jump into something new. They seem like they always have one foot out the door, never truly prepared to commit to one place or one thing. 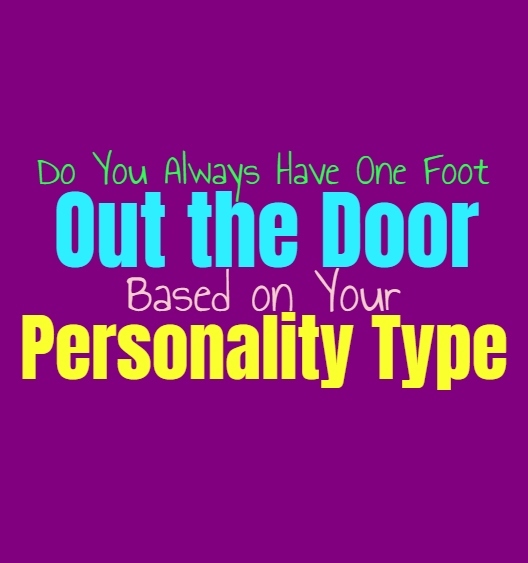 Here is how likely you are to have one foot out the door, based on your personality type. INFJs believe in standing by their commitments, but there are certainly times when they appear to have one foot out the door. When the INFJ is being dragged into a new environment or a new situation, they certainly appear to have one foot out the door. In these situations the INFJ is ready to bolt or find a way to be on their own. They don’t like being in these unknown places, or around people they aren’t close to. INFJs can also seem this way when they are first getting to know someone, since they aren’t quite sure they can trust them yet. Once the INFJ does commit to someone and trust them, they no longer appear to be ready to bolt at all. ENFJs are often very steady and committed people, and so they don’t usually appear to have one foot out the door. While this isn’t something people see about them, there are times when they are hesitant to really remain in one situation or relationship. ENFJs do have one foot out the door when they are first getting to know someone, since they need to be sure they can trust this person. ENFJs also find themselves capable of stepping out if they find out that someone is using them or taking advantage of their giving nature. INFPs do sometimes appear to have one foot out the door, since they have a tendency to bounce around. They don’t like feeling stuck in the same place for too long and really need to feel capable of exploring new things. When it comes to taking on a large project, INFPs do sometimes appear ready to step away from this for the sake of something which draws their attention. When it comes to relationships the INFP can appear hesitant, but they are more capable of committing than people realize. Before the ENFP has really committed to something or someone, they do appear to have one foot out the door. They are curious people who can be easily distracted by something which excites them. They want to feel free to explore different possibilities and really dislike when they feel stagnant. Because of this desire to explore, the ENFP does seem like they always have one foot out the door. This doesn’t mean that it is true, since ENFPs are capable of being loyal and trusting companions when they care for someone and commit to them. INTJs are very steady and committed people, and so for most they don’t seem to have one foot out the door. The only time the INTJ might appear this way, is when people first meet them and don’t really understand them. At first their very logical and straightforward behavior can cause them to seem disinterest in people, and so very capable of cutting them off whenever they want. In truth INTJs are not this way, since they value their commitments and the people they love are very important to them. ENTJs are actually very focused and committed people, who stand by the choices they make. When they are close to a person then they don’t seem to have one foot out the door. They will do whatever it takes to make their relationships work, and truly stand by anything they commit to. When the ENTJ takes something on, they will stand by this and work hard to see it through to the end. They don’t have one foot out the door, since they don’t believe in being flighty or untrustworthy. INTPs do often appear to have one foot out the door in most situations they are in. They have somewhat aloof personalities, which makes it hard for people to see what is going on inside of their minds. INTPs often seem ready to change their minds or drop any of their current commitments without a moment’s notice. INTPs are curious people who want to feel free to explore the different possibilities that are out there. This can cause them to appear like they have one foot out there, even if they don’t. ENTPs definitely seem like they have one foot out the door at all times, since they enjoy bouncing around a bit. ENTPs like to feel free to explore different possibilities and really don’t like feeling restrained. This can make it difficult for them to commit to things sometimes, wanting to feel open to try something else. This also makes it seem like ENTPs don’t want to commit to relationships and so some might feel like the ENTP always have one foot out the door. This isn’t necessarily true to who they are, it is just how it sometimes appears from an outside point of view. ISTJs rarely appear to have one foot out the door, since they are such steady and loyal people. When they make a commitment they don’t believe in backing out of it, and will do whatever it takes to see it through. ISTJs don’t believe in bouncing around, instead they believe in being practical and reliable people. For them having one foot out the door is a sign of weakness, and they don’t want those types of people in their lives. ESTJs don’t usually have one foot out the door, instead they are very committed and reliable people. For them it is failure to back out once they have committed to doing something, or committed to a relationship choice. ESTJs don’t believe in bouncing around or being incapable of standing by their choices in life. They rarely appear to have one foot out the door, as it takes a lot for them to decide to give up on something and is not something they often do. ISFJs don’t usually appear to have one foot out the door, since they are seen as committed and reliable people. They believe in standing by their choices and their loved ones no matter what. For the ISFJ it is important to be someone that others can rely on through everything, and trust to always be there. For them it isn’t hard to really be around or trust people who aren’t capable of standing by their commitments and they don’t want to be that type of person. ESFJs do care about being someone that is reliable and who stands by their commitments in life. They might appear to have one foot out the door to some, but that is because they have so many things they are trying to juggle at once. ESFJs have high standards for themselves and so sometimes it can appear that they feel this way about others as well. Some people around them might not understand just how committed they are when they make a choice, since they do have their own form of a door slam behavior. Most of the time though, the people who know the ESFJ realize that they don’t have one foot out the door. ISTPs don’t always commit to things easily and so this certainly makes them seem to have one foot out the door. They enjoy being free to change their minds and bounce around from one thing to the next. They are adventurous people who really enjoy being able to do whatever they please without feeling obligated to others. This certainly makes it seem like the ISTP has one foot out the door at all times. ESTPs do sometimes seem to have one foot out the door, since they are curious people who dislike feeling stagnant. They enjoy being free to bounce around a bit and to make their own choices in life. ESTPs often have an adventurous side to them, wanting to be able to experience something new and exciting. They don’t like feeling stagnant and so this can cause them to have one foot out the door most of the time. ISFPs don’t like feeling trapped or stagnant and so because of this they do often appear to have one foot out the door. They want to feel free to explore something new and to go wherever their inspiration might lead them. ISFPs are curious people who like living in the present moment, and this can cause them to bounce around from place to place. For the ISFP it isn’t about a fear of committing, for them it is about going wherever they feel happiest. ESFPs don’t really like feeling trapped or obligated, since they enjoy feeling open to new experiences. For the ESFP feeling stagnant is a miserable thing, since they want to be able to dive into something new. They live in the present moment and go wherever their hearts might lead them. Their curious nature and desire to experience new things, definitely causes the ESFP to have one foot out the door in most situations.